my bare cupboard: Thai coconut curry rice with salmon "
I don't really know how to cook rice in the stove top . I've been using rice cooker here and sometimes even using it , I can't seem to get it right tsk ! I had to check several sources on how much is the ratio between Jasmine rice and water . 1 part rice to 1 3/4 parts water . The last time I've made curry rice , t'was delicious but the grains were a bit mushy , too much water , methinks . This time , it is just right , in my opinion . Better use a non-stick pan for this dish , for sure the rice won't stick at the bottom , though you still need to stir it from time to time . Cook it in a very low heat after the initial simmering or else the liquid will evaporate fast and the rice is still uncooked . Not much flavor inside the salmon but the curry rice compensates for it . This dish goes really well with the easy and refreshingly spicy salsa that I've made or you can just make a simple vegetable salad instead . Don't forget to make the simple lime and soy sauce dressing as recommended in the GoodFood's site . I've forgotten to make it tsk ! This month Lena of Frozen Wings is hosting the Asian Food Fest and the theme is Thai cuisine . Do check out her site if you want to join . * Defrost salmon in the fridge several hours before using . Scale salmon and rinse , pat dry with kitchen towel , sprinkle with ground white pepper on both sides ; set aside . * In a large non-stick pan , add a generous tablespoon of extra virgin olive oil , add shallots and cook over low heat until lightly golden . Add the curry paste and cook for a minute . Take off pan from heat , add rice , lime zest , lime juice , coriander stalk , salt and fish sauce . Mix everything together until well incorporated . You can prepare this for up to 2 hours ahead . * Pour coconut milk and water over the rice and curry mixture and stir well to combine . Over medium heat , let mixture simmer then add in the lime leaves , stir and adjust taste . Turn down heat to the lowest setting of your stove and cover the pan . Cook for about 15 to 20 minutes , stirring from time to time to prevent the bottom from scorching or until rice is cook through . In the last 10 minutes of cooking add salmon fillet , depending on the thickness of the fillet , check after 5 minutes and flip the fillet , if necessary . Take off pan from the heat and leave to rest for five minutes . Dish up and serve immediately . * Mix ingredients above and adjust taste . Chill for at least 30 minutes before using . For the lime-soy dressing : juice of 1 lime, some soy sauce and brown sugar . Mix and adjust taste . This post is linked to the bloghop event Asian Food Fest . This month's theme is Thai cuisine and is being hosted by Lena of Frozen Wings . 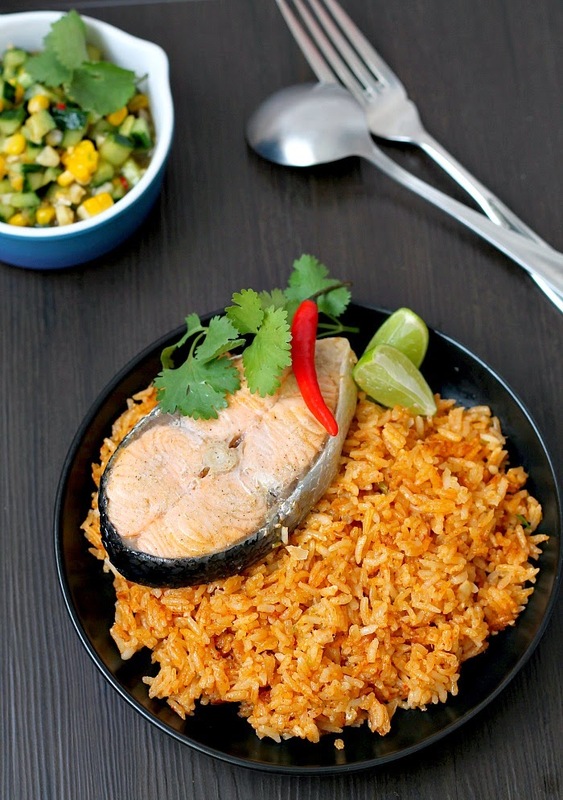 My mouth is watering :-)) Both curry rice and salmon are droolworthy! coconut red curry rice..sounds nice..like nasi lemak thai style ..haha..thanks for your entry, anne! I too have never tried to cook rice on the stove. I rely on the rice cooker 100 %. 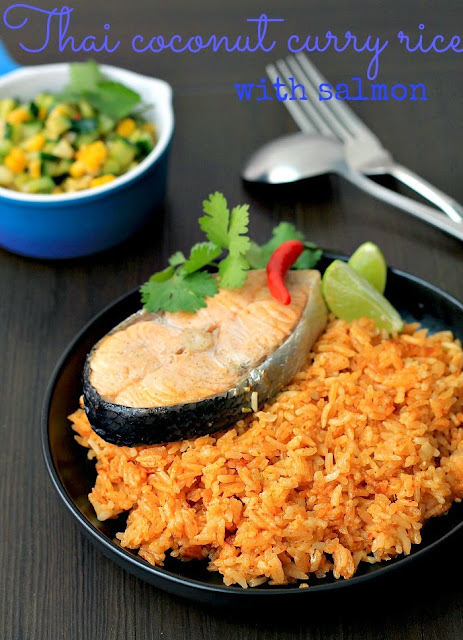 Your curry rice looks appetising and to go with salmon, plus the salsa, yummy! I'll definitely be trying this! Thanks for sharing! Really Anne, you don't know how to cook rice on stove top? You must be joking, someone who does difficult tasks of baking bread, buns and lovely cakes, rice is such a simple thing to do. I cook different types of rice, mostly basmati all on stove top. But don't worry your rice looks al dente to me just as I make my quinoa. The whole dish makes me drool as I love salmon. 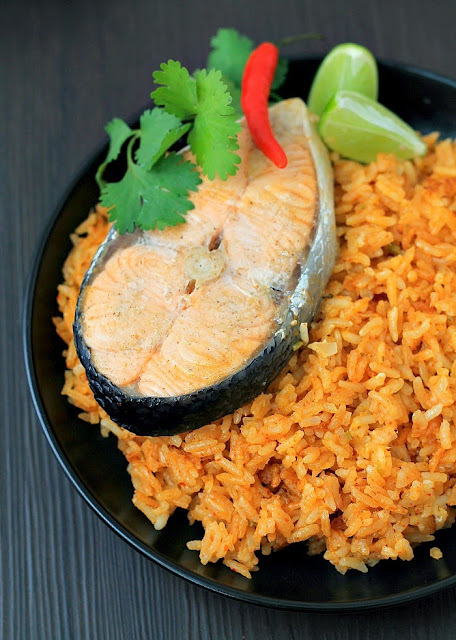 Hi Anne, this rice look very appetizing but I'll pass the salmon, not really fancy. Love the pictures! !